It’s not uncommon in cheaper devices to find a ribbon cable soldered directly to the circuit board like the one pictured above. Using a connector would have been a much more resilient approach, but adding parts adds cost. If you take a close look you’ll see things aren’t looking so great anymore. [Chaotic and Random] pulled this board out of his VW Camper Van. Rather than buy an expensive replacement part, he shows us how to repair a soldered ribbon wire connection. This repair is rather invasive and he suggests trying some hot-air rework (possibly using a heat gun) to fix up any misbehaving connections. But if that has failed it’s time for the knife. The first step is to cut the ribbon so that the LCD can be removed from the board. From there he peels the remaining scrap off ribbon of the pads. This makes us cringe as it could lift traces from the PCB, but he was gentle enough to avoid it. Now comes the time to start reassembling. After thoroughly cleaning the pads the ribbon is cut straight and resoldered. The trick is to flow the solder without melting the ribbon. He uses tin foil to cover the tip and cools it on a moist sponge just before reflowing solder. It sounds like more art than science. But when the only alternative is to spend hundreds on a new part it may be worth a try. Nice. The very thin flex ribbons on newer small electronics doesn’t even melt at soldering temps, making it easy to solder. If the substrate melts it means it probably wasn’t soldered in the first place. Glued connections to flexible substrates are quite common and are a royal PITA to fix. 3M make an eye-wateringly expensive top-bottom conductive double-sided sticky tape for this kind of application. I have had a lot of luck with a conductive trace writer pen to fix breaks, can be used to draw finer lines than solder for even the smallest traces. I’ve also seen a number of these glued connectors fail. It’s strictly adhesive that’s holding a non-metallic (carbon?) conductor in place. These are very commonly used to attach the LCD glass to a PCB. The eye-wateringly expensive tape to use, I think, would be 3M’s 9705/9706. Not much is needed, but a roll needs to be sourced. In their data sheet, they say to bring the adhesive to 70-100 C to make removal easier. After cleanup, just pressure is needed to adhere the two surfaces (i.e. the ribbon and the PCB). The tape is neat; it is designed to conduct through the two surfaces but not along them–like water through a bunching of drinking straws. There’s also 9703 tape. It’s Z-axis tape too, not sure what the differences are. You can get it in small pieces for a much, much more affordable price. Adafruit has a good description of the stuff. This kind of problem is the number one thing that breaks in TI calculators. Thanks! I was wondering what happened to mine. I looked and you were right. I saw somewhere on the web where a guy replaced the ribbon sheet on his broken TI calc with a regular ribbon cable. That was me. I have repaired a few dizen of the calculators in my collection by soldering 30-awg wire to replace some or all of the conductors in failed ribbon cables. I have found this to be successful far more often and last much longer than trying to fix the oruginal glue. Look into a product called Chip Quik – it’s an alloy that reduces the temperature at which the solder melts, and it makes rework like this very easy. I thought chip-quik was just for easy chip removal…hmmm. It is… I successfully used it to replace the LCD in the cluster on my Audi by keeping the temperatures low. Jason, I am interested in replacing the LCD in the cluster on my Audi, if you are able to provide any tips or information I would really appreciate it. Did you use a tiny soldering tip and put Quick-Chip on each tiny pad on the circuit board? I tried to solder something whilst it was turned on once. It earthed through the soldering iron and killed the thing I was working on. Yeah, my boss ruined a TV ~25 y.o. by soldering on a live circuit with a grounded soldering iron. I repaired a break in a very similar ribbon cable on my old(ish) BMW recently. First I stripped off a layer of plastic on one side of each end, and cleaned and tinned the exposed copper. After that, I overlapped them by about 1MM, lined things up, taped it in place (clear packing tape on the back side), and applied heat directly through the plastic on the top. I found that the plastic had a high-enough melting point that I could apply a hot iron directly to it to heat the layers below, and still come back with a good-looking joint instead of a smoldering mess. I was amused by how ridiculously easy it was to splice this sort of cable, which looked impossible or not even worth trying until I looked up the cost of even a used replacement part and realized that it was certainly worth a few hours of repair effort, even if it didn’t work. Once you have fixed a thin ribbon cable (and its just a strait piece of cable with the same end connectors), it helps to swap the whole cable around, so the parts of the cable that have been stressed most often end up in a location where they don’t move at all. Tip for whoever assembled HP designjet 500 plotters: make sure that when the printhead is in its right-most location, the cable is long enough to still make a nice U-bend, and does not kink near the printhead…. I had this problem with a Saab 9-5, they used the same thing, alternating carbon strips and adhesive. 3M (I believe) make the cables, and sell a very expensive tool to bond them. There is a specific heat/cool curve that needs to be followed to ensure it bonds and then solidifies properly. Quick fixes were usually to jam a rubber band against the contact points and compress it in, or to apply a hot air tool to it and press the ribbon down with the end of a wooden ice lolly stick. The design issue with the Saab at least was that you were placing this cable in a box, under a black dashboard, with 8x 1 watt incandescent bulbs for illumination. Then placing it on top of a stereo system that runs hotter than the nose of a shuttle. No need to cringe over the risk of lifting traces. The component is already dead as you go in. It really can’t get more wrecked. The standard solution is to pay a chunk of cash for a new part. Hacking the dead board is a gamble to win, with nothing to lose. It seems a bit of education is in order. The connector shown is called a heat seal connector. It is attached using both heat and pressure to bond the material to the glass and PCB. My company actually makes a piece of equipment to do this, our main customer being 3M who makes the material. Do not put a hot iron on it directly and do not add any solder. Most usually a quick fix for this type of connection is to just take a soldering iron set to a lower temp and apply heat to the traces through a thin piece of rubber. We call this rubber material an interposer. The bonding temp would be about 180C. The reason this material is used the most is the pitch of the connections. It is hard to find a connector that is .050″ pitch or less and can connect with ITO traces on a piece of glass. The alternative is a zebra connector. Happy to answer question of you have them. Thats exactly how I repair broken original gameboys. You would be amazed how many people throw out or sell off “broken” gameboys. I have saved dozens from getting thrown out this way. Just open it and put something over the end of the ribbon that wont melt and hit it with an soldering iron and pressure. No cutting necessary I do this while it is on to see which lines need more or less heat. They will turn black or clear, then go to normal as they cool. I once bought 8 broken gameboys for 10 bucks and got 7 of them working this way. Not too shabby. Is there any reason a locking connector couldn’t be soldered to the board? It would remove any difficult with registration and avoid having to heat the ribbon cable. These “zebra” connectors are usually carbon traces which don’t bind nicely to solder, adding solder just raises the trace contact. Where exactly did he find an LCD screen on a VW camper van??! 1) low setting on a flat tip solder iron… ideal around150C. but never hotter than 225C. 2) cut a strip of thermal conductive rubber pad material (ShinEtus “Sarcon” is one trade name)… it is easy to get: it is the same rubber thermal pad used in CPU / HeatSink interfaces… salvage from an old computer MB or pick up at a computer parts shop. Why? The rubber is thin, is loaded with alumuminum dust to be heat conductive yet electrically insulated. The rubber gives good heat and pressure to the heat seal without the hot tip of the iron actually touching (melting or tearing) the heat seal. 3) Place the rubber strip over the area to be repaired, Hold the rubber in place with a thin wooden stick (like tounge depressor or similar), rub the area back and forth with the iron, light pressure just to get the heat into the bond (about 20 seconds)… work a centimeter area at a time. 4) experiment on times, but after 20 seconds or so remove the iron tip and use the wooden tool to hold down the rubber rather hard against the connection spot. Give it 30 seconds to cool off… the conductive adhesive will have re-set with the contacts pressed into electrical contact. When done, (repeat to other failed areas if needed), cover the bond with some high quality (kapton type) tape to reinforce the bond. This works 90% of the time, I have thousands of such repairs under my belt. BTW… the adhesive is pre-printed over the contacts only… if the contacts are ruined, you might need to find a replacement heat seal of the correct pitch (not likely). You can salvage from a cheap calculator if you are lucky to find the right contact pitch (there are industry common standards… it does happen)… just heat with the rubber in place and heating gently with the iron, start at one end and lift the connector as it comes loose… do NOT pull or the material will delaminate and you will have ruined it. 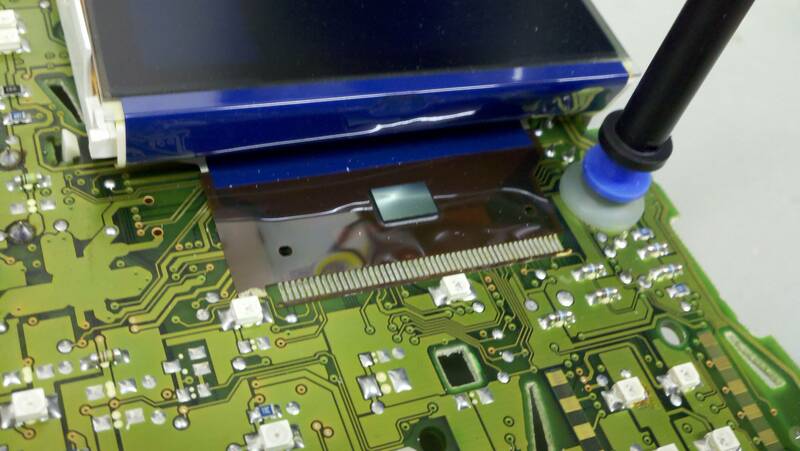 Never solder these polyester based heat seals… they are just plastic film with special glue… you will ruin them. Oh, clean up contacts on the board with q-tip and acetone, no NOT scrape the board contacts. Thanks for the reminder about not melting the ribbon! I have always wanted to try this myself because adding parts to the circuit board is very costly. Being a student, I do not have that kind of money to spend so I think my only option might be to solder it! I will give it my best shot! Thanks for the information!